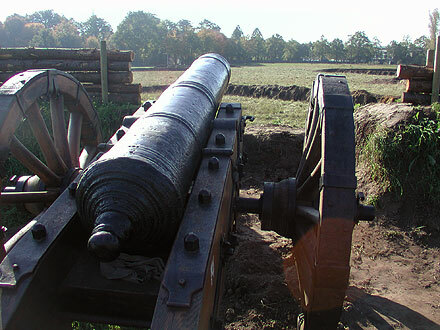 The 24-pound cannon overlooking the battlefield where some trenches may be seen. This and other battlefield photographs were taken the day following the third battle. Being in the battles I had no opportunity to take pictures then. The battle was to simulate a siege, with a battlefield unlike any I’ve experienced before. At one end, a low bastion was of built-up earth with storm poles set into the sides and on this artillery was mounted. Zigzagging in front of that across more than half of the battlefield were trenches, like in one of the illustrations on this Web page, with the removed earth heaped on the trench side facing the enemy (so as a trench went from zig to zag, the removed dirt was placed on one side, then the other). The trenching was done with an excavator beforehand, so any shovel work by re-enactors was simply for show. The trenches themselves were only about two-thirds of a meter deep, but what was dug out piled on one side of the digging, to give enough protection to allow us to stand erect in a trench. At Sealed Knot events I’d attended in the U.K., there was artillery, often plenty of it for a grand show. Due, however, to the economics of manufacture, transport, storage, and gunpowder costs, plus moving onto and off the fields, nearly all S.K. 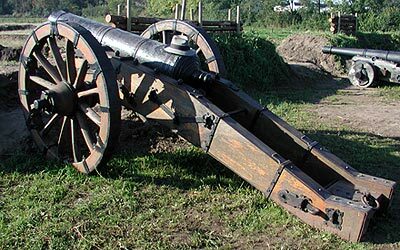 cannon are of small bore, such as three-pounders, sakers, falcons, etc. At Slag om Grolle, though, among the cannon atop the bastion was a real, firing 24-pounder, the caliber of cannon often used in siege warfare back then. And when it fired, its sound, smoke and concussion were not to be forgotten, especially when one was in front of it. Hopton’s Tercio was on the Dutch side all three days, so my preparation for shouting “¡Santiago!” and “¡Viva España!” had to be adjusted to “¡Muerta a España!” The only other Sealed Knot unit was the Parliamentarian Manchester’s which was placed with the Army of Flanders. The Bavarians with whom I breakfasted went to that side, too (although during the third battle they ‘deserted’ to the Dutch side). The zig-zag nature of trenches. With the removed dirt piled up on the enemy side, standing safely was possible. To provide scale for the 24-pounder, atop the touch hole at the breech is my fedora, its total length 12 inches. We on the Dutch side had the trenches and the 24-pounder. 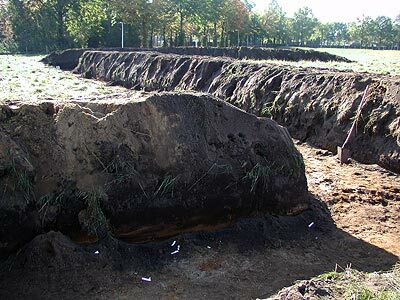 As aspect of the arrangement was to extend the trenches day by day toward the Army of Flanders side, and the actual digging was done between battles by the excavator. To begin the battles on the second and third days, a scenario called for an engineer to be out in front of the trenching, protected by pike and musketeers, then set upon by enemy cavalry. 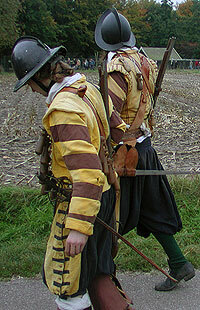 The cavalry would create some casualties and chase the engineer and surviving Dutch troops from their spot. On the second day, I was among the protecting party and on cue acted fierce, then scampered back to the trenches. The cavalry consisted of six Czech horsemen and their mounts. Their kit was the armor of cuirassiers. The riders were very skilled and the horses were the best trained those in Hopton’s had seen, comparing to the Sealed Knot. The warning was that if the pike formation did not maintain an even, unwavering front, one, then the rest, of the horse would exploit the smallest of gaps. Keeping that in mind, we pike were quick to respond to any threat and make walls with our ‘Charge for Horse.’ They never broke into us, but not for want of trying. All three battles were grand shows and complex, with thrust and counter thrust. Being a participant, I could focus only on the situation and people immediately around me, follow orders, and wait-charge-stand-withdraw-wait... So, my experience was constricted which reflects upon my reportage. On the first battle east Germans in the role of a Scots regiment fought so enthusiastically they broke nearly half their pikes. Near the crowd line, Hopton’s skirmished against one, then another enemy unit, with the French coming into our trench and wanting to go at us in the S.K.-style push of pike. We obliged and, since they were more enthusiastic than experienced, we trounced them. Two actions for the second and third battles suffered communication issues. On the second day, the Army of Flanders was to prevail. The Dutch side was to make a final grand charge to be met by the enemy boiling out of their defenses, which was to inflict numerous casualties, forcing the Dutch to retreat pell-mell. The cue for the grand charge was, as our side was told, two volleys of cannon fire. The other side got that as three volleys of cannon fire. So, we charged – and they stood there. Ordered not to go down into the enemy, we on the Dutch side gestured like we were being repelled and took many casualties before falling back in a flaccid retreat. For the opening of the third battle, we Hopton’s pike left our pikes back at the bastion and pretended to be digging one of the trenches, making a nice little show of throwing out dirt. The scenario was that the enemy cavalry, after chasing away the engineer and his guard, was to regroup, then charge those digging the trenches, and we were to scurry like rabbits back through the trenches to retrieve our pikes. We were in one trench line and on the far side of the field was the second trench line, a mirror image of ours. The Czechs had consulted beforehand with our Colonel but Czech <> English – something was lost. The engineer and his men were dispersed, the cavalry regrouped – then charged the other trench line where they did not chase after unarmed diggers but battled feisty musketeers. We could only watch. Finally, our pike officer asked the Colonel if we could go back to fetch our pikes, which we did in a most undramatic way. Overall, the three days of battle went well, with plenty to see and do. If one group of troops was waiting or marching on the field, there were other groups going at each other. Planning and leadership paid off. The audience saw non-stop action, and each re-enactor was served generous portions of fighting. Near the end of the second day's battle, I saw a couple of puffs of pale smoke erupt from the hip area of a soldier jumping up several meters behind us. He struggled to pull off his breeches, exposing his thighs. More smoke and he went down. Several rushed to his aid, one of whom was the wife of Hopton's colonel who knew some Sealed Knot first aid. She took control of the situation. She reported that on the upper thighs, close by the - ahem - family jewels, she saw fabric melted into the burns which looked "like cooked bacon"; the fabric was a wool/polyester blend. As she administered first aid at the place of the injury, someone asked: "Are you going to kiss it to make it well?" Even the burn victim laughed. Then he fainted. An ambulance came for him as all of us left the field. The next day, the man was seen walking about. The incident was due to the man carrying packets of gunpowder (paper cartridges?) in his pocket and then falling upon some lit match. The final battle swayed back and forth. As the Army of Flanders pushed back the Dutch, Hopton’s was ordered to fall back to the trench in front of the cannon-topped bastion. Soon after we dropped into the trench, I heard the cry that the 24-pounder was about to fire – only meters directly behind us. Officers yelled at us to get down behind the trench sides to protect us from the forthcoming concussion. I hunkered down. I saw the puff of smoke from the touch hole with its flash, then the great roll of white smoke from the muzzle – but being protected by the trench, only lightly felt the concussive blast sweep above us. Then the word came to advance. We scrambled out of the trench. I dropped onto my hands and knees to provide my back as a step for a musketeer who was having difficulty. Then an officer hoisted me up by my arm and away we went at the Army of Flanders – but not before my snapsack opened to spill everything out, which I rammed back in and rejoined the charge. The battle concluded with the Dutch pouring down into the defenses of the Army of Flanders with a great pretend slaughter ensuing. The moment in all three days that stands out in my memory happened during that confused assault on the second day. Several commented during and after the battle that the weather conditions were not usual. The sky was overcast whilst the air very still. Cannon and musket smoke did not drift away but instead tended to sink to the ground. The Army of Flanders made that second cannon volley and Hopton’s was among the vanguard of the charge; I was running not far behind the Colonel. The memory is seeing only him running in front of me, no one else, his sword raised high and the pale cannon smoke closing around, enveloping him from sight. Such a moment!